"This is an absolutely compelling story of an astonishing treatment program with prison inmates that, against all odds, actually worked. The leaders of the program and the correctional officials open a door to the hearts and minds of a violent prison population, allowing us to see them at intimate range, while at the same time producing a remarkably positive influence on the atmosphere of the prison as a whole." INTERVIEW: Jenny Phillips is a cultural anthropologist and practicing psychotherapist in Concord, MA. For over ten years, she has worked in state and county prisons, teaching courses on emotional literacy skills. She is the author of Letters from the Dhamma Brothers: Meditation Behind Bars and the producer and director of the documentary film The Dhamma Brothers. SUBJECTS: General Interest. Features. Public Affairs. Social Issues. Religion. Spirituality. Psychology. Criminology. Books. Regional Interest - Massachusetts. Alabama. Social Sciences. Anthropology. AVAILABILITY: Nationwide by telephone. Travel by arrangement. Boston. "The stories of the Dhamma Brothers ring with the truth and power of their experiences, and offer the hope for renewal and rehabilitation within a dismal and punishment-oriented correctional system. It gives you hope for the human race," says Sister Helen Prejean, author of Dead Man Walking and recipient of the 1996 Pax Christi Pope Paul VI Teacher of Peace Award. Prejean is speaking of Letters from the Dhamma Brothers: Meditation Behind Bars, to be published by Pariyatti Press, September 2008 by Jenny Phillips. Phillips is a cultural anthropologist and practicing psychotherapist in Concord, MA, who works in state and county prisons teaching courses on emotional literacy skills. She is also the producer and director of the award-winning documentary film The Dhamma Brothers which opened in numerous locations across the United States starting in April 2008 to critical acclaim. Through Phillips's initiative, the ten-day Vipassana intensive meditation program was established at the Donaldson Correctional Facility, an Alabama maximum security prison. The inmates / meditators began writing to her about their lives and quest for inner peace. Letters from the Dhamma Brothers: Meditation Behind Bar, includes over four years of those letters which tell the stories of change since participating in the Vipassana meditation program. Their letters point to the possibility of genuine transformation. In March 2008, for the first time in history, more than one in every 100 American adults is in jail or prison, according to a new report released by the Pew Center on the States. 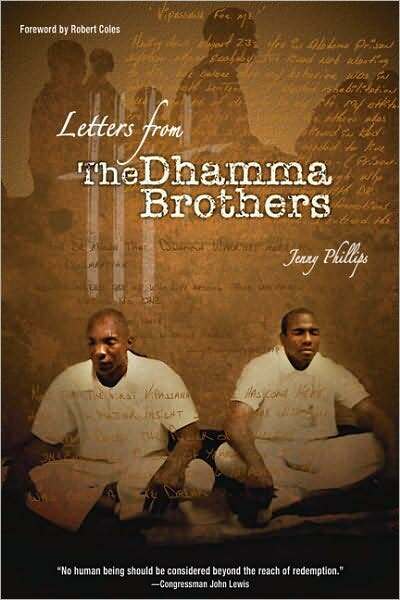 With a reported 2,319,258 adults held in U.S. prisons or jails at the start of 2008, Letters from the Dhamma Brothers, offers hope for an urgent social issue. Letters from the Dhamma Brothers is "one of the most sensitive expressions of hope, capacity for change and potential vehicles for institutional health that I have read in my career in criminal justice," said Scott Harshbarger, former Attorney General of the state of, Massachusetts. 1) Why Donaldson Correctional Facility? Was there something special about that prison that drew your attention? 2) Describe your first impressions of Donaldson prison and the Dhamma Brothers. 3) How did the experiences of building the program at Donaldson and coming to know the Dhamma Brothers change you? 4) Can you tell me some stories about the men, who they are and why they are in prison? 5) How did the Vipassana program change the Dhamma Brothers? Can you tell me some stories about their individual personal journeys through 100 hours of meditation, and what they had to deal with as they navigated the program? 6) How does Vipassana meditation work? Is it an effective form of treatment and rehabilitation? What does the research show about this? 7) Is there any outcome research on the effectiveness of the program? What does it show? 8) Could the results of this program have implications for the U.S. prison system? 9) As a cultural anthropologist, could you describe "prison culture"? and spread of a new, more peaceful culture? We would appreciate hearing from you if you plan a mention or review on your show or in your publication. Thank you.